The rich, sweet voice pursued Koremitsu from behind. Koremitsu kept his back slouched as he scowled and moved forward, but that intoxicated voice would follow him around. Koremitsu’s face was taut, and he kept groaning within. He wanted to visit Honoka at the hospital, but Kazuaki kept pestering him. Kazuaki was weeping, “What are you saying”, and looked utterly displeased, but on the next day, he immediately got to Koremitsu’s house. —I do wish to marry this child I took utmost care of as your wife, Mr Akagi. With a guiltless smile, he stuffed the cage containing the stoic-looking chameleon to Koremitsu. After seeing the expectant eyes and the blushing face, Koremitsu understood that Kazuaki was really trying to establish a friendship by marrying the chameleon, not out of spite. Thus, Koremitsu could not refuse Kazuaki and took the chameleon in. He seized the opportunity to barge into Koremitsu’s room. And nonchalantly followed Koremitsu. Koremitsu tried his best to act indifferent, but Kazuaki did not mind, instead dabbling away with floral knowledge like a certain flower otaku of a ghost, using the exact same sweet, rich voice. Hikaru had his position taken by his big brother, and kept his usually chatty mouth shut, grimacing beside Koremitsu. Surely he too must be feeling conflicted. Koremitsu inadvertently glanced aside to glare at Hikaru, and the latter continued to maintain a grimace. Honoka mistook Kazuaki, who was crossdressing and selling illegal drugs, as Yū. As a result, she was lured to the basement of a building, locked inside a room, was drugged, and nearly burned to death. Koremitsu went over to save her, and said the most embarrassing confession he ever made to Honoka. —Honoka Shikibu is not an ordinary classmate to me!!! Koremitsu resisted the impulse to yell out loud. How was he supposed to face Honoka after saying such an embarrassing line? With Kazuaki following him, he was really troubled, not knowing what to do. A refreshing sweet voice rang at his ears, and he was taken aback. I guess it’s to be expected of Hikaru’s brother. Koremitsu yelled as he pushed away Kazuaki’s face, the latter having brought his face close. In any case, did Kazuaki really have any right to criticize Honoka? Not all that happened the past few days were caused by Kazuaki’s ploy. Koremitsu recalled the message he received in the morning, and a chill suddenly arose in his chest. Hikaru’s face paled as he lowered his head, peering at the little screen from Koremitsu’s side; he was left speechless, his face frozen. And he said, the messages titled “The women around Lord Hikaru’ that slandered the women involved with Hikaru was not sent by him. He did not put the ink-covered umbrella in Yū’s room, and did not rile up Asai and the rest to turn them on each other. He merely lit the incense when he locked Honoka in the room, and did not set fire. Kazuaki did not appear to be lying. There was another ‘Poppy’ other than him. It was likely that the same sender was the one who stated that Fujino was pregnant with Hikaru’s child. For Hikaru, his relationship with his stepmother Fujino was the biggest secret. Fujino was pregnant at this point, and in the following month, Hikaru’s little brother or sister might be born. Hikaru concluded to Koremtisu that he could not possibly be the father, that during this time, he was clearly rejected by Fujino, and never did anything that would make her pregnant. Fujino typically kept her distance from Hikaru, and thus, despite such rumors running rampant, they probably would be deemed as baseless. However, Hikaru looked despondent and heavy-hearted as he lowered his head, staring at the message, his eyes looking anguished. Just thinking of those messages flying around would be enough to unsettle anyone. Koremitsu wanted to find a way to catch the culprit. So that such pranks would never happen again. The brooding time was immediately snapped by Kazuaki. The image of Kazuaki beaming and blaring at Honoka’s face “Mr Akagi’s girlfriend is me, so you do not have to appear now. Shoo shoo~. Ahaha, that is quite a sad face you are making~” appeared in Koremitsu’s face, and he was overwhelmed with a migraine. The hospital appeared in front of him, but he was pondering seriously perhaps he should first grab Kazuaki by the neck and drag the latter back to the Mikados. While Koremitsu was in serious thought, Hikaru let out a little murmur. A girl with slightly curled long hair, slender body and a fleeting presence stood in front of the hospital doors. Koremitsu too was taken aback. It appeared that Yū had been waiting for Koremitsu to arrive. She approached with her usual forlorn expression, the white skirt swaying slightly above her slender ankles, the soft strands of hair swaying gently in the frigid winds. She gave the same fleeting presence as the one when she locked herself in the apartment. Koremitsu watched her with bated breath. Kazuaki ducked behind Koremitsu’s back. Koremitsu’s shoulders were quivering as he fumed. Koremitsu was quietly taken aback. Yū stared at Koremitsu silently, her eyes causing the latter to be a little breathless. It seemed Koremitsu could not press on any further. Yū stared back at Koremitsu, her expression as poised as she was the previous day when she asked, “’is the date still valid’?”. At that moment, “…Yeah”, Koremitsu answered, “I got a few things I want to ask you about, Yū”. He had to talk to Yū about Honoka. Hikaru watched over Yū and Koremitsu from the side, his breath bated. The big brother clinging by the back, poking his head out from the side, looking somewhat fearful and vengeful at Yū. It was impossible no matter how he thought about it. However, Yū appeared to be waiting for Koremitsu to speak, her eyes never did leave him. Curious as he was, Koremitsu was unable to ask. The cellphone in his pocket vibrated. He hastily grabbed his cellphone from his pocket, had a look at the message, and found it to be another anonymous one. Koremitsu’s face got grim immediately. The title of the message was ‘the promised…’. Once he opened it, an unmitigated chill seemed to rush through his spine, causing him to widen his eyes. “Hikaru, I shall offer the purest, speckless Comfrey in your garden to revive you. Come to the place where you and I first began. To the place where you betrayed me. Hikaru, staring at the phone from the side, let out a gasp. 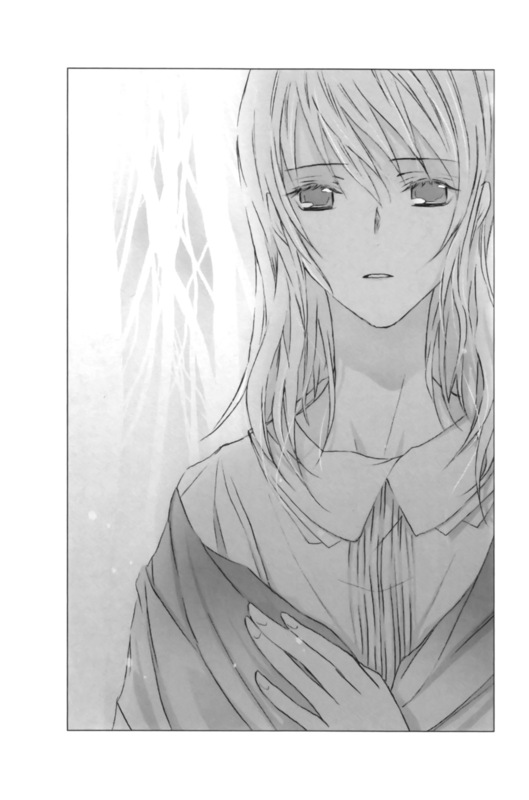 The message was signed off with the name ‘Fujino’—Hikaru’s stepmother, the woman he so loved most! Furthermore, there was a photo attached to the message, one of an elementary school girl with her hair tied in twintails, her eyes closed as she laid on the floor. Koremitsu’s heart jumped, his mind blank. Shioriko was barefooted, her milky legs exposed from her fluffy knee-length skirt to her ankles, and her pretty pink fingernails could be seen clearly. A groan was eked out from Koremitsu’s mouth. Kazuaki and Yū too did realize something was abnormal, showing perturbed looks. Koremitsu instinctively made a call to Shioriko’s cellphone. The response from the phone was a voicemail, ‘the cellphone you are attempting to reached may not be switched on, or may be beyond reception. Koremitsu then called home. His aunt Koharu picked it up. He yelled, his teeth practically gnashing. Both Hikaru and Koremitsu’s shoulders shivered in unison. Koremitsu hung up the phone, and made a mad dash home. Kazuaki’s yell could be heard from behind, but Koremitsu was not in the mood to be bothered with that. Upon seeing Koremitsu return home, sweating profusely and panting furiously, Koharu scowled. She pointed her chin at the chabudai. Koremitsu was so impatient he waved off Koharu’s question, and ripped off the packaging hastily. Written on the surface was the neat handwriting of a woman, with the recipient being ‘To Mr Koremitsu Akagi’, addressed to his house. The back was as Koharu said, just the name ‘Fujino’ written on it. Soon after, Koremitsu found a pair of stolen girls shoes inside. They were little track shoes with pink shoelaces, the shoes Shioriko just wore! Koremitsu too did not know what was going on. Why was Shioriko abducted? I shall offer the purest, speckless Comfrey in your garden to revive you. Koremitsu’s eyes were bloodshot, his rage directed at the one who did this. He took out the namecard of Mikoto Ono, which he kept in his student notebook the entire time, and dialled the number written on it. To meet Hikaru’s stepmother—Fujino Mikado. Mikoto immediately picked up the call. Koremitsu held in the rampaging emotions inside him as he stated that a person calling herself Fujino abducted an elementary school girl living in his house, even forwarding the message with the photo over. Once she heard of it, Mikoto remained silent for a while on the other end of the phone. Hikaru muttered with a feeble voice. —Come to the place where you and I first began. If the grandfather was to know about it, surely Koremitsu would end up beaten. However, this old man would become a fool when dealing with Shioriko, and surely he would not wait for Koremitsu to bring Shioriko back. Koremitsu was mentally prepared for his jaw to be snapped, a rib or two broken, and he proceeded to ride on the black sedan Mikoto prepared for him. While on the sedan, he gave Asai a call. He informed Asai that other than Kazuaki, there was another one calling herself the ‘Poppy’, and Asai’s breathing became grim. Shioriko’s biological father, Sōichirō Kuze, wanted to have Shioriko in a place where he could control. Now that his past crimes were exposed, he was convicted by the public as a result, and probably was unable to deal with this daughter born out of wedlock. However, such a possibility was not impossible. Koremitsu’s heart was being ripped apart, and he lowered his head. Asai muttered, and hung up the phone. Hikaru’s face paled as he watched Koremitsu and Asai’s conversation. Watched Koremitsu with those poised eyes under the neat, trimmed black hair. There was a space between the comfortable back seats and the driver seat, so the conversation they would have would not be overheard. There was practically no tremor to be felt in the car, and it felt as though they were riding on a glider on the road. Koremitsu gritted his teeth, the hands on his thighs clenched as he lowered his head, his face frozen. In the meantime, his phone kept receiving messages. “I grew these blue-purple Lilies of the Nile as I reminisced about you. The way their thin stems straightened in the bright moonlight really resembled you, and I kissed every single one of them. The Lilies of the Nile are also known as African Lilies. Their floral language is ‘the most beloved’. I really hope that I could groom you, my most beloved, lock you within a beautiful box, and hide you from everyone else. “Everyone around you finds it unbelievable as to why you are being treated so coldly. “I knew right from the beginning that our love was a forbidden cardinal sin. It was not permitted by this world, and no one around us would bless us. My body felt like it was cut, stabbed through and burned–it was a tragic romance and bitter love that was accompanied with sadness and despair. I definitely must not let anyone else know, and I will continue to love him in this darkness where the moonlight cannot shine into. Did we not lock our fingers and swear? I tried to show disdain. The fact was that it was determined you were my ‘beloved’ the moment you said the first beautiful line to me. I never did forgive you. I will never forgive you for only looking at others when you should have been looking at me, and being blissful. I will never forgive you for escaping alone from the world that was just the two of us. I will never forgive you for loving me, swearing an oath of love with me, hurting me, and deserting me. I will never forgive you, for letting out of the clasped fingers as you showed that beautiful, cruel smile. “Your ‘most beloved’ should be me. “I was the only one who knew of your final moments. I was the one who ended your life. The one beloved by all the flowers—Hikaru Mikado. On that stormy night, I may have ended your life. So, I buried those wretched women who stained you, and brought a new sacrifice over, towards the place where our hearts passed, the place where it all began, and ended. Whenever he slid the screen, words would appear. Those words were murmuring directly into Koremitsu’s ears, digging into his eyes, lips, and his nostrils, even teasing his inner heart, corroding it little by little. It felt highly discomforting, rather than sweet. Koremitsu’s back shivered a few times. Certainly, the one sending such messages was not normal. “To the place where you betrayed me. Koremitsu swallowed his bitter saliva as he read the message that was sent along with Shioriko’s photo, and Hikaru groaned from the side. His voice got increasingly feeble. Koremitsu too gripped the cellphone firmly. No matter how many times he replied, he was left at the voicemail. The messages kept coming, and Koremitsu was so anxious his throat was about to break. Koremitsu lifted his head, and saw Mikoto Ono’s poised, calm smile. It was not the emotionless face of a doll, but a colorless, transparent expression that could calm an agitated heart. If she was actually showing such a face on purpose, surely it was a lot of self-restraint that the highly emotional Koremitsu could not imagine. Soon after getting on the car, Koremitsu heard that Mikoto was the maid serving Fujino’s family. And he learned that Mikoto was studying at an all-girls school in the city, a senior, 2 years older than Koremitsu. Though there was an age difference between her and her master Fujino, they were close since young, and Mikoto knew about Hikaru from Fujino’s mouth. Hikaru used to say that ‘Mikoto’ was the one that person was really concerned with. Hikaru’s shoulders quivered, his eyes tentative and intimidated as he looked over at Mikoto. Hikaru’s face was slowly contorted into anguish. They resembled so much to such an extent. It was the same when he saw Fujino kiss the Wisterias at Shioriko’s house, the same when he met Fujino at the calligraphy contest held at the Gonomiyas. How could such a pair, so strikingly similar, not be blood-related in any way? Koremitsu’s heart was ostensibly at knife-point, a chill rampant in him. Surely this was why Hikaru never spoke up? That he was so frenetic whenever he spotted Fujino, saying that he could not be here, that he kept begging Koremitsu to head to a place where he could not see her. For he knew how grave a sin they had committed. He fell in love with the woman who became his father’s wife, and even bonded physically with the body of his blood-related aunt. Even in the other world, he continued to feel the guilt of yearning for her, and surely, that was why Hikaru showed such a gloomy expression. Hikaru committed two great taboos with Fujino! He bit his lips, staring at the hollow, despondent eyes. Fujino’s home was so close Hikaru’s mother’s, so whenever Fujino stayed at the home of Hikaru’s mother, it appeared that she would be there all day. Perhaps she felt pity for her nephew, whose mother passed away, and who had mutterings behind his back by his father’s family in Tokyo, saying ‘The daughter of a mistress gave birth became a mistress that bore a child’. Perhaps she was simply delighted to be taking care of her cute angelic nephew, staring up and admiring her. Mikoto could not hear Hikaru’s voice. She continued calmly. Hikaru’s father, the head of the Mikados, fell in love with Fujino on first sight, for the latter resembled Hikaru’s deceased mother so much. He proposed to Fujino, hoping that she would marry him once she graduated from college. Hikaru lowered his head despondently. Mikoto, who till this point narrated everything stoically as a bystander, appeared to be pondering for the first time, causing Koremitsu to wonder if Fujino did lower her head as feebly as Hikaru did, what sort of feelings she had when Hikaru’s father proposed to him. However, Mikoto regained her poise immediately. But this incident utterly ruptured the relationship between Hikaru and Fujino. What would the feeling be like, to have the woman dearest to him became his stepmother, and they were leaving under the same roof? She never did talked with him except when they had to, and she did not meet him in the eyes. Hikaru too felt anguished to be with Fujino as he was, and for that reason, he left home. In spite of them, he still yearned for the one dearest to him, Fujino. But, what was Fujino thinking? While Mikoto kept explaining, the messages were sent to Koremitsu’s cellphone, boldly stating the utter infatuation ‘Fujino’ had for Hikaru. She loved him so much she was suffering. That even though she had to bear the guilt, she could not hold in those feelings. She wanted to sink with him to the bottom of basin filled with Wisterias. Mikoto mentioned, and Koremitsu noticed that the car has stopped. The elderly chauffeur opened the door. The outside was still dazzlingly bright.. But the refreshing was icy, chilling. A Western-styled mansion stood with the snowy white sky and the ostentiously grey and white forest as the backdrop. A rustling could be heard from the trees, swaying with the wind. Koremitsu listened to these sounds as he stepped onto the damp,grassland. It appeared they were at the atrium of this mansion. And perhaps, without Koremitsu knowing, they went through the main doors. Hikaru too looked gloomy and forlorn as he stared at what appeared to be a house out of a fairy tale. Suddenly, the front doors were opened to the sides. The little feet covered by the white sandals gently landed upon the stone floor. Swaying in the air was the thin, blue-grey skirt and the faint violet shawl on the shoulders, and the white blouse clung to her body, emphasizing her shockingly thin upper body. The faint brown strands of hair absorbed the cold sunlight, giving off an alluring golden glitter that spread from atop the shawl; the slender white nape stood elegantly, and atop it was a petite face with an anguished look on it. The eyes were filled with melancholy, the face pale, the petal-like lips giving off a destitute presence. He understood she was not Hikaru, but he was still bewildered. The friend stood beside Koremitsu, looking despondent. That beautiful woman had the same face as that face of his. She was such a beautiful woman, one could have a hallucination of her being otherworldly. Hikaru’s stepmother—Fujino Mikado lifted her head at Koremitsu, saying with an utterly anguished voice.